St George's Veterinary Centre, Weybridge opened in January 2011 and aims to provide the highest standards of veterinary care to the pets of Weybridge and the surrounding areas. The attractive, clean and well-equipped premises have been designed to create a calm and friendly atmosphere. 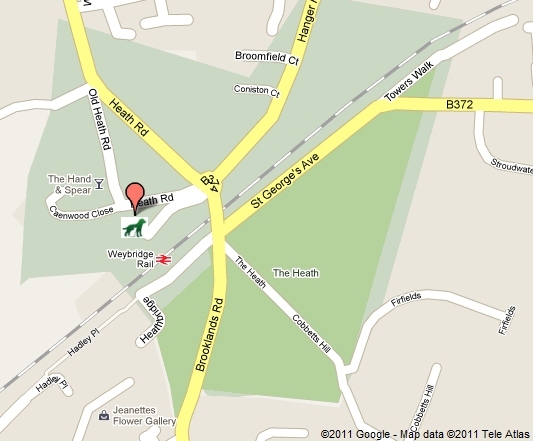 St George’s Veterinary Centre is independently owned and is not part of a chain or corporate group. Our clients can rely on a highly personal service, with every animal receiving individual attention. The practice occupies a convenient location adjacent to Weybridge Railway Station, and has its own private car park with ample free parking. There is a mini-roundabout at the entrance to the station, simply take the next exit after the station and follow the road for 100 yards where you will see the practice entrance on your left. If you are familiar with the “Hand and Spear” pub then the practice is situated 100 yards before this. Please see the “Services” section of our website to view the full range of veterinary services we offer.